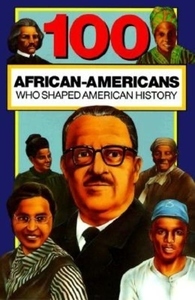 Teeming with interesting nuggets of fact and information, 100 African Americans Who Shaped American History includes such legendary men and women as Benjamin Banneker, Dred Scott, Mary Church Terrell, George Washington Carver and Bessie Smith. Also included are Rosa Parks, Martin Luther King, Jr., Thurgood Marshall and many, many more. Organized chronologically and meticulously researched, this book provides an educational look at the prominent role that these individuals played and how their varied talents, ideas and expertise contributed to American history. * Concise & Easy to Read Text * Fully Illustrated * Includes Index, Time Line, Trivia Quiz & Suggested Projects * Makes History Fun! Bluewood Books' "100 Series" includes 28 additional fun and educational titles, including: * 100 Hispanic Americans Who Shaped American History * 100 Native Americans Who Shaped American History * 100 Scientists Who Shaped World History * 100 American Women Who Shaped American History * 100 Athletes Who Shaped Sports History * 100 Inventions That Shaped World History * 100 Artists Who Shaped World History * ...and many more!